Our team has been doing a lot of traveling for work this past season, and I just looked up from the summer to realize it was already Thanksgiving. If you’re anything like us, you may be craving a season of rest, family and holiday lights. Maybe it’s because my husband and I work together, or because I’m so passionate about what we do and who we serve, but my work family is as important to me as my biological family. Generally speaking, our work families, including those we serve, are in our day-to-day lives more than anyone else! We don’t usually have other friends or family we spend 160+ hours a month with. So as the holiday season approaches it makes sense we would think of family – in all its forms. As I write this I’m in the heart of downtown Chicago, sitting near a window overlooking Michigan Avenue, and snow is wrapping itself around high-rises and skyscrapers for the first time this year. Despite the hustle of this city and streets, the snow doesn’t seem to notice – as it slowly and silently continues to fall, creating a scene from a greeting card. It’s a reminder to me that the end of the year is coming the same way, slow and steady, regardless of how busy we are. So, as the holiday season fast approaches, the question is: how do we pause in a meaningful way to acknowledge the people we spend over 2,000 hours a year with? On average people are recommended to give 5 meaningful compliments per day. So if you haven’t given 1,300 compliments to your co-workers and clients yet this year, it may be time to catch up! Rather than cookies or cakes, spend time making a memory or laughing about memories from the year, over a cozy mug of Roam’s hot chocolate (still with marshmallows included, of course). Note: If your team or clients aren’t local, send them Starbucks gift cards and setup a video call, so you can all connect and chat together over hot drinks you already picked up the tab for. Some of us have holiday traditions with our families, so why not with our work families too? Start and keep traditions you can look forward to all year, like a team trip, fancy dinner or Roam member holiday party! Spend a day, or at least part of a day, enjoying something festive together. Ideas include but are not limited to a game of holiday movie trivia, serving at a local nonprofit as a team or outdoor ice skating. 2019 is right around the corner. This holiday season let’s extend the concept of family to include more people: our co-workers, teams, clients and anyone who could use a little more light this year. Lynne Moyer is the Founder & CEO of Luminate Marketing and is passionate about leveraging the power of influence for good, and speaking on behalf of those who don't have a voice. Lynne was recently recognized as a leading business professional in community impact through the Top 30 Under 30 Awards, and an honorable mention from PR Daily Awards in 2017. 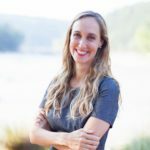 When not creating awesome marketing solutions for nonprofits and churches, Lynne enjoys running and kayaking along the Chattahoochee River, gardening, and time with her husband and their little puppy, Bear.